London. A snowy December, 1888. Sherlock Holmes, 34, is languishing and back on cocaine after a disastrous Ripper investigation. Watson can neither comfort nor rouse his friend – until a strangely encoded letter arrives from Paris. Mlle La Victoire, a beautiful French cabaret star writes that her illegitimate son by an English lord has disappeared, and she has been attacked in the streets of Montmartre. 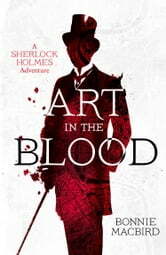 Racing to Paris with Watson at his side, Holmes discovers the missing child is only the tip of the iceberg of a much larger problem. The most valuable statue since the Winged Victory has been violently stolen in Marseilles, and several children from a silk mill in Lancashire have been found murdered. The clues in all three cases point to a single, untouchable man. Will Holmes recover in time to find the missing boy and stop a rising tide of murders? To do so he must stay one step ahead of a dangerous French rival and the threatening interference of his own brother, Mycroft. This latest adventure, in the style of Sir Arthur Conan Doyle, sends the iconic duo from London to Paris and the icy wilds of Lancashire in a case which tests Watson's friendship and the fragility and gifts of Sherlock Holmes' own artistic nature to the limits. Enjoyed the book yet it did not live up to the hype. Very little thought in the story line, written to earn money not for the reader. Lack lustre book. Didn’t have the Sherlock pizazz that I expect.